The APC wil welcome 3 colloquia this December, whose subjects are of great interest to UnivEarthS members and others! . Please find in the poster below all the necessary informations, locations and dates, speakers’ names, titles and abstracts. The first meeting is on (this coming) Thursday Dec 6, at 2pm in 454A (on gravitational waves! 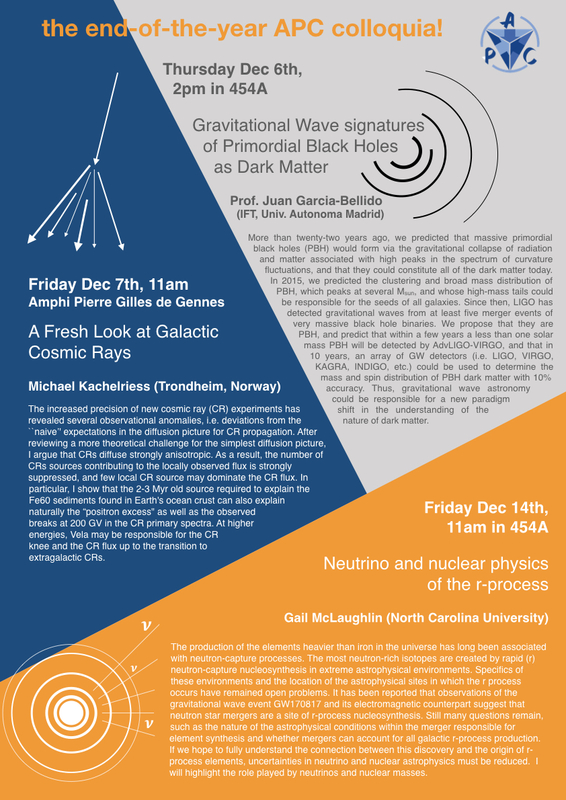 ), followed by Friday Dec 7 at 11am in Amphitheater PGG (on cosmic rays!). Abstract: More than twenty-two years ago, we predicted that massive primordial black holes (PBH) would form via the gravitational collapse of radiation and matter associated with high peaks in the spectrum of curvature fluctuations, and that they could constitute all of the dark matter today. In 2015, we predicted the clustering and broad mass distribution of PBH, which peaks at several Msun, and whose high-mass tails could be responsible for the seeds of all galaxies. Since then, LIGO has detected gravitational waves from at least five merger events of very massive black hole binaries. We propose that they are PBH, and predict that within a few years a less than one solar mass PBH will be detected by AdvLIGO-VIRGO, and that in 10 years, an array of GW detectors (i.e. LIGO, VIRGO, KAGRA, INDIGO, etc.) could be used to determine the mass and spin distribution of PBH dark matter with 10% accuracy. Thus, gravitational wave astronomy could be responsible for a new paradigm shift in the understanding of the nature of dark matter. Abstract: The increased precision of new cosmic ray (CR) experiments has revealed several observational anomalies, i.e. deviations from the “naive” expectations in the diffusion picture for CR propagation. After reviewing a more theoretical challenge for the simplest diffusion picture, I argue that CRs diffuse strongly anisotropic. As a result, the number of CRs sources contributing to the locally observed flux is strongly suppressed, and few local CR source may dominate the CR flux. In particular, I show that the 2-3 Myr old source required to explain the Fe60 sediments found in Earth’s ocean crust can also explain naturally the “positron excess” as well as the observed breaks at 200 GV in the CR primary spectra. At higher energies, Vela may be responsible for the CR knee and the CR flux up to the transition to extragalactic CRs. As usual, coffee and cookies will be available!